In the December 2008 We three - Adithya Biloor , Adithya U N , Adithya Shankar decided to go to Kodachadri by trekking. We stayed there . While coming from the top, next morning we saw Amur Falcons which were migrating from Siberia to Africa. Myself and Adithya U N made some good images of those falcons. 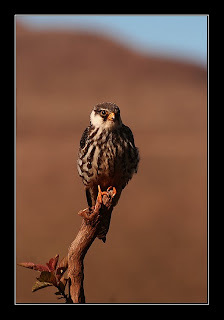 In fact it was the first record of sighting of Amur Falcons in Kodachadri. In the end of the December I went To Pandavara ThaLi . It's a stream flowing amidst thick forest. A myth about this place is Pandavas have spent some time here during the period of Vanavasa. 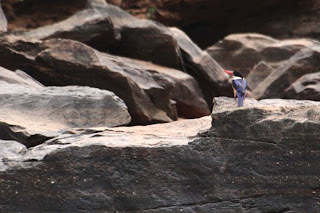 There I saw Black Capped Kingfisher. This is also first sighting of this beauty in our region. Though I could not make any good images I managed to take record shot. 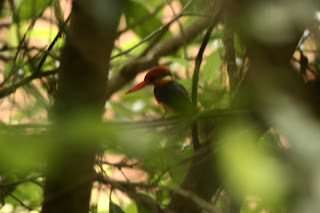 In the month April at my in-laws house I saw Oriental Dwarf Kingfisher which is also a rare bird.Unfortunately this time also I could not make a decent image of this bird.